Another day, another iPhone 7 leak. With less than two months to go before Apple is expected to debut the iPhone 7 range , the number of leaked videos, photos, specs and other titbits continues to escalate - we're pretty much in prime iPhone rumour season right now. Today we've got a suggestion that the new Apple handsets will launch the week of 12 September, from none other than Evan Blass (@evleaks), one of the most well-known and well-respected tipsters in the game. No real surprises that the phones are coming in September - the last two pairs of iPhones were unveiled on 9 September in both 2015 and 2014 - but it's the most precise hint we've had so far. You might want to book the week off work. That's not all - there's another (short) clip to add to the growing list of leaked videos we've seen in recent months. This one shows what looks like three iPhone 7 Plus (or iPhone 7 Pro?) handsets with a regular iPhone 7 on top of them. We don't get a particularly good look at the phones, and don't see the bottom of the devices at all, but that larger, dual camera lens is again in evidence - supposedly one of the key differences between the two categories of iPhone this year. 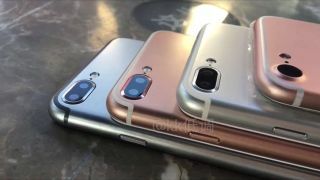 The rose gold, grey and silver colour options are present and correct, but as always take this new footage with a grain of salt - the fact that it's short and limited in scope suggests these could well be dummy handsets built from leaked case specifications, rather than actual working handsets. Never mind the iPhone 7 - what about the Samsung Galaxy S8?